A segment of the global beer merger on display on an Albany supermarket shelf. Speaking of beer, I’m wondering why the world’s biggest beer company is trying to get even bigger by buying the second-biggest. What’s in it for them, and why should beer drinkers care? Last week, Anheuser-Bush InBev announced an agreement in principle to acquire SAB Miller for about $104 billion. According to a story in the New York Times on Oct. 14, the combined company would account for 29 percent of all beer sales worldwide. Huge mergers like this never make sense to me. The companies might save money by combining operations and firing people — which is bad for the individuals involved and their communities — but the companies also have to spend more on administration. Big-time beer drinkers probably know this, but I didn’t know or had forgotten that both Anheuser-Busch and Miller are international companies that sell many different brands. 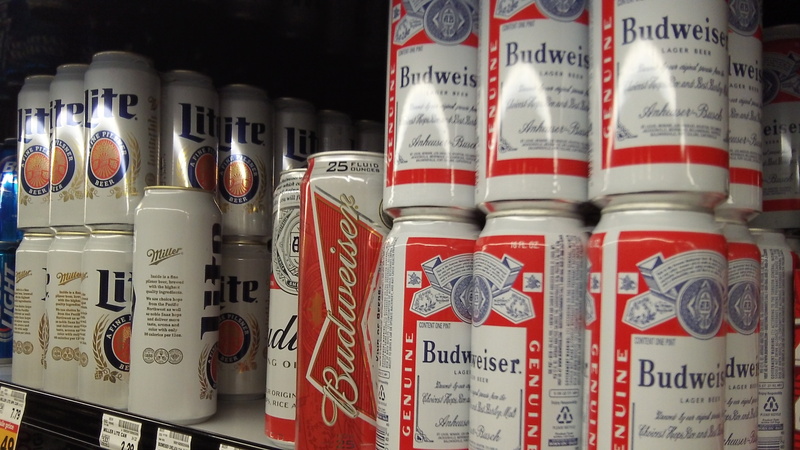 Anheuser-Busch InBev owns, among others, Budweiser, Corona and Stella Artois. And SAB Miller’s holdings include Grolsch and Pilsner Urquell. SAB Miller also owns part of Molson Coors, whose brands include Miller Light, Coors Light and Blue Moon. The story in the Times reminded readers that a Brazilian company, AmBev, had merged with InterBrew of Belgium and then took over Anheuser-Busch in 2008. So when you buy certain brands of nationally advertised beer in Albany, you are taking part in the globalization of the beer business whether you know it not. Which is all the more reason to consider Oregon or even local brands instead, even though, being smaller, they have to charge a little more. I hope the antitrust folks take a hard look at this level of consolidation. I might be wrong but I believe I heard this company would have 70% of US sales. I love local craft brewers.Some really outstanding beers are made here. I getting ready to test my first home brewed batch of Porter. At least my wife has quit ordering Bud Light in brewpubs. I recently discovered the pleasing taste of Twilight Summer Ale by Deschutes Brewery. Not hyper-local like Calapooia, but Oregon based just the same.